"How can we display Interfacaes in Rectangle Icon?" We recieve this question quite often, so I shall write it down how to do so here. There are two ways to do display Interfaces in rectangle icon like this. 1. Right-Click on Interface in the Diagram Editor. 1. 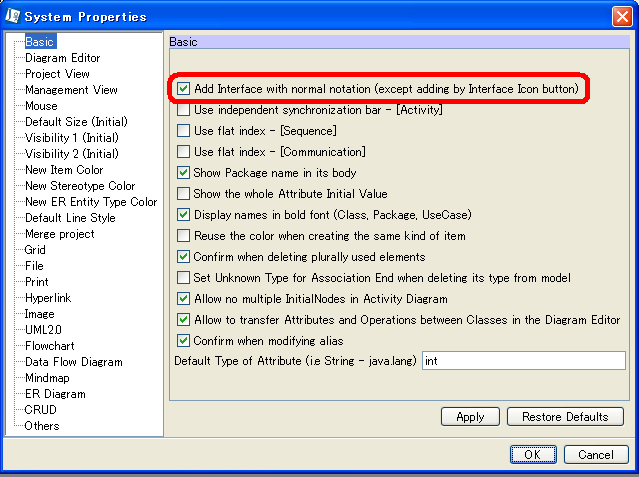 Select Interface in the Diagram Editor. 2. Select the [Stereytype Normal] button from the Top Main Menu. In the next release, a new option will be added to enable you to create Interfaces in rectangle icon always. Since JUDE (Both Professional and Community ) version 5.3, you can create Interfaces in rectangle icon by default. By doing so, when you create Interfaces on the Diagram, they will be represented in rectangle icon. As long as this option is on, when you add Interfaces on the Diagram from the Structure Tree, Interfaces will be represented in rectangle Icon. In AStah Professional 6.7.0, this option seems to have disappeared, and I don't seem to be able to find a replacement. I have imported a bunch of classes from Java, and am making class diagrams for them and it is annoying to have to change them each time. Additionally this post only seems to reference how when creating new interfaces to default them to Rectangles. I am taking existing interfaces from my Structure and adding them to class diagrams. Sorry but this option has been removed since version 6.7 as you point out. Please follow the step below to enable this option by editing the Astah's property file. 3) Change its value to true as below. If you could not find the line, please add one in as below. Now all the Interfaces drawn by dragging and dropping from the Structure Tree onto Diagram should appear in rectangle notation.